Difference between revisions of "Namkhé Nyingpo"
* Dudjom Rinpoche. ''The Nyingma School of Tibetan Buddhism: Its Fundamentals and History''. Translated and edited by Gyurme Dorje and Matthew Kapstein. Somerville, MA: Wisdom Publications, 1991. * Gyalwa Changchub and Namkhai Nyingpo. ''Lady of the Lotus-Born: The Life and Enlightenment of Yeshe Tsogyal''. Translated by the Padmakara Translation Group. Boston: Shambala, 2002. * Germano, David. “The Seven Descents and the Early History of Rnying ma Transmissions.”'' The Many Canons of Tibetan Buddhism''. PIATS 2000: Tibetan Studies: Proceedings of the Ninth Seminar of the International Association for Tibetan Studies, Leiden 2000: 225-263. * Harding, Sarah. 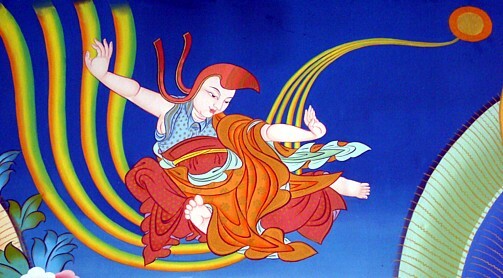 ''The Life and Revelations of Pema Lingpa''. Ithaca: Snow Lion Publications, 2003. * Herrmann-Pfandt, Adelheid. “The Lhan kar ma as a Source for the History of Tantric Buddhism.” In Eimer Helmut, Germano David (eds.).'' The Many Canons of Tibetan Buddhism''. PIATS 2000: Tibetan Studies: Proceedings of the Ninth Seminar of the International Association for Tibetan Studies, Leiden 2000: 129-151. * Roerich, George N.'' The Blue Annals''. Calcutta: Royal Asiatic Society of Bengal, 1949. * Szántó, Péter-Dániel & Arlo Griffiths. "Sarvabuddhasamāyogaḍākinījālaśaṃvara." In'' Brill Encyclopedia of Buddhism, Vol. I Literature and Languages'', edited by Silk Jonathan A. Leiden: Brill 2015, 367-72. * Yeshe Tsogyal. ''The Life and Liberation of Padmasambhava, Vol. I & II''. Padma bKa'i Thang. rediscovered by Terchen Urgyan Lingpa, translated into French by GC Toussaint, and into English by K. Douglas and G. Bays. Emeryville: Dharma Publishing, 1978. * Yeshe Tsogyal. ''The Lotus-born: the life story of Padmasambhava''. Transl. Erik Padma Kunsang, ed. Marcia Binder Schmidt. Boston: Shambhala, 1999.